Now coming to North America! With the AQUAVITAL MULTITEST 6in1 you quickly, easily and safely determine the 6 most important water values in fresh water: pH, total hardness (GH) , carbonate hardness (KH) , nitrite (NO 2 ) , nitrate (NO 3 ) and chlorine (Cl 2 ). 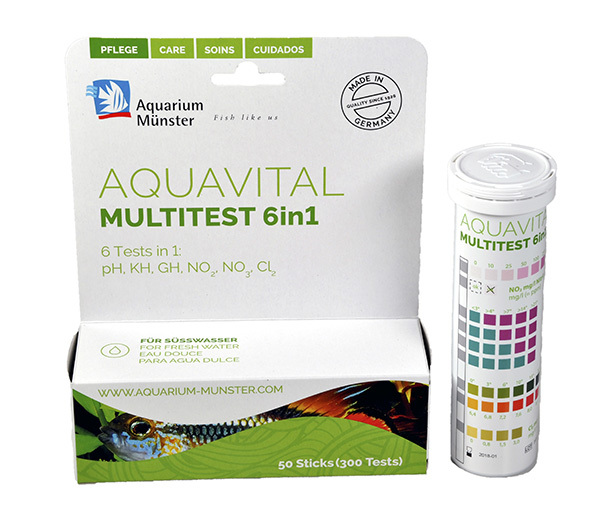 Even inexperienced aquarists can quickly get to a safe water analysis with the AQUAVITAL MULTITEST 6in1. The test strip only has to be immersed in the water for one second and then shaken off briefly. After about one minute, the color fields are compared with the color scales on the can. I love corydoras,plecos & Livebearers and I’m looking forward to your news letter thanks. I love corydoras,plecos & Livebearers and I'm looking forward to your news letter thanks.